Micro Analytical Laboratories, Inc. is an independent accredited laboratory, which has provided high-quality analyses and responsive service to the asbestos and lead abatement industry since 1989. Transmission Electron Microscopy ( TEM ) analysis of asbestos in air, drinking water, and bulk samples, following AHERA and EPA protocols. 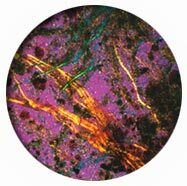 Polarized Light Microscopy ( PLM ) analysis of asbestos in building material, rock, and soil samples. Phase Contrast Microscopy ( PCM ) analysis of air samples. Mold and Spore Analysis in Air, Bulk, Swab, and Tape Lift Samples. Flame Atomic Absorption ( FLAA ) analysis of lead in paint, soil, air, wipe and waste water samples. Graphite Furnace Atomic Absorption ( GFAA ) analysis of lead in air and drinking water samples.